This is a time in your life where you are discovering who you are and what you’re passionate about. It’s a time to make mistakes and to learn and grow from them. In the midst of this self-discovery, you are learning how to find a balance in your life. I hope you enjoy every second of this new chapter and I hope these tips help you conquer life on campus. 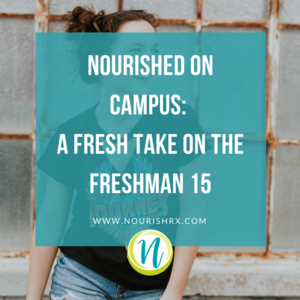 Here are 15 tips that will help you stay healthy, nourished and balanced on campus. Freshman typically aren’t allowed to have cars on campus which means you will be walking a lot more than you usual. Depending on the size of your school there is probably some sort of transportation for you, but my advice is to only use it if you are in a pinch! Getting the extra steps in will do you no harm, and it will contribute to your time management skills, which are essential to have on campus. 2. Take advantage of the “free” gym membership! A membership to your campus recreation center is usually included in your tuition, so it’s not actually free. Use this as motivation to use your membership! Let’s change our perspective and think of working out as a way to not waste your money! 3. Join an intramural or club team! Always been interested in volleyball but never learned how to play? No biggie! This is your opportunity to try new things and step outside your comfort zone. It's a great way to learn a new sport, make friends and stay active! 4. Get exercise in early. Once your workout is out of the way, you can have the rest of the day focus on making it your best. Don’t let your class schedule dictate you from getting your exercise. It will start your day on a good note by boosting productivity, energy, and focus. This one really is free! Group exercise is what helped me to become consistent at the gym. Your instructor plans the workout for you, which is one less thing you have to worry about. Not to mention, I met some of my best friends in these classes and we held each other accountable to go every week! How could you say no to fun music and exercise with friends? It can be a great escape from stress too. 6. Find a gym buddy! Because working out is wayyy more fun when you are with a friend! The gym can be intimidating and it’s easier to face when you have a gym buddy at your side. This could also be a great opportunity to try out group exercise together. 7. Make dining hall food work for you. Yes, there is a plethora of unhealthy options but every dining hall has a variety. There should always be healthy options offered to you such as fresh produce, oatmeal, hard boiled eggs, salad bar, yogurt. So learn how to work with what you got! The “all-nighter” stereotype can be easily avoided so don’t give in to it. If you don’t get your sleep, you will be useless in your classes and struggle to get through the day. This is your chance to recharge so make it a priority and try to make your goal 6-7 hours. This goes along with being aware with the resources your school has to offer. We all know how stressful school can be. There are several student-run groups and programs to get involved in to help with the stress. Look out for your daily meditation group, or weekly yoga classes at the recreation center. Get yourself a reusable water bottle and stay hydrated! Giving yourself time to recuperate will result in a higher quality of studying. Not to mention it will make the process less painful. Sometimes students get so caught up in school life that the resources their university has to offer goes right over their heads! Every campus should have guidance counselors, nutritionists (sometimes even dietitians), tutors, and advisors that can help you get organized. When it comes to mental health, you will always have an outlet. You are paying for that unlimited meal plan so use it to your advantage! There is nothing wrong with taking an apple or banana from the dining hall on your way out. If you know you are going to be stuck in the library all day bring containers and pack yourself a meal for later. Campus life can get crazy and you may not have the time to implement healthy habits into your day, and you know what? That’s completely normal! Finding that balance is important but some days you aren’t going to have control over your day. Nothing is going to be perfect, so remember to give yourself a break when things don’t go as planned. We're a group of non-diet, balance seeking, cupcake consuming, quinoa loving, registered dietitians. By sharing our expertise, favorite tools and services, we want to help you heal your relationship with food and body and find your own balance amidst the diet culture chaos. Ready to start healing your relationship with food? Get Your FREE Guide to getting started, plus a BONUS exercise to help you reconnect to the eating experience. You have successfully joined our subscriber list. Check your inbox for an email with your Ditch the Diet Download!